Well readers, I think I've sunk to a whole new level! I have been adding pond scum to my smoothies! :) I've been hearing about spirulina from various sources and I finally broke down and bought some with my last coop Frontier order. I've spent this week researching it and putting it in my smoothies and I have to say that I am really impressed! Here is a little bit of what I learned. dried cakes called Dihé, which are used to make broths for meals, and also sold in markets. Nutrients: Spirulina's nutrient content amazes me. One tablespoon of this can serve as a tremendous nutritional supplement. Protein: Spirulina has 20 times as much protein as soybeans growing on an equal-sized area of land. It is a complete protein, containing all essential amino acids, though with reduced amounts of methionine, cysteine, and lysine when compared to the proteins of meat, eggs, and milk. It is, however, superiour to typical plant protein, such as that from legumes. Spirulina is 65-71% complete protein. In comparison, beef is only 22% protein. Essential Fatty Acids: Spirulina contains a nice array of EFA's which are so important for overall health. It has Gamma-linolenic acid (GLA), alpha-linolenic acid (ALA), linoleic (LA), and arachidonic acids. (AA), Stearidonic acid (SDA), eicosapentaenoic acid (EPA), and docosahexaenoic acid (DHA). Vitamins: Spirulina also contains a nice array of vitamins, especially B vitamins. They include B1 (thiamine), B2 (riboflavin), B3 (nicotinamide), B6 (pyridoxine), B9 (folic acid), B12 (cobalamin), vitamin C, vitamin D, and vitamin E. A teaspoon of spirulina contains 2.5 times the RDA of vitamin B12 and contains over twice the amount of this vitamin found in an equivalent serving of liver. 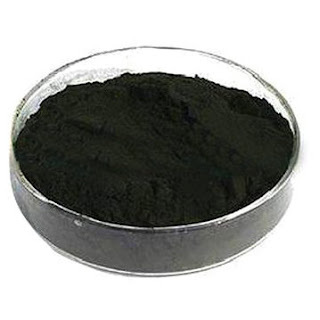 Minerals: Spirulina is a rich source of potassim and also contains calcium, chromium, copper, iron, magnesium, manganese, phosphorus, selenium, sodium and zinc. Phycocyanin: This is a blue pigment that is found only in blue-green algae that has increased the survival rate of mice with liver cancer in laboratory experiments. Aids in protecting the immune system. There is some evidence that spirulina increases production of antibodies, cytokines (infection fighting proteins), and other cells that improve immunity and help ward off infection and chronic illnesses such as cancer. Spirulina is great during a fast as it supplies nutrients in a naturally digestible form that are needed to cleanse and heal while curbing the appetite. Beneficial for those with hypoglycemia between meals because of its high protein content. It actually helps the liver and pancreas to regulate blood carbohydrate levels. There is emerging evidence that it may also help those with type 2 diabetes by reducing fasting blood sugar in as little as two months of use. A study using animals showed that Spirulina helps prevent heart damage caused by chemotherapy using Doxorubicin without interfering with its anti-tumor activity. In another study participants exhibited significant changes in cholesterol and blood pressure including lowered total cholesterol; increased HDL cholesterol; lowered triglycerides; and lowered systolic and diastolic blood pressure. Wow! Another great benefit for all of you work-out fiends is that spirulina will help prevent skeletal muscle damage. The Chinese and Cuban Olympic teams eat the stuff daily. Spirulina may reverses age-related declines in memory and learning. Some studies suggest that spirulina may protect against allergic reactions by stopping the release of histamines (substances that contribute to allergy symptoms, such as a runny nose, watery eyes, hives, and soft-tissue swelling). I found alot of material and testimonials to this effect when researching this piece. Spirulina is marketed in several ways. It can either be found in pill, powder or flake form. If you opt for the pill form, a typical recommended dose is about 3000 mg a day broken up into 3 doses. Many just use the powder or the flakes and add it to their smoothies and use it as a nutritional supplement. I'm a fan of using it this way. As with any food or supplement, eating spirulina in it's real unprocessed form offers the greatest potential benefits. Now saying that, I was a little overwhelmed by the, shall we say, briny smell of spirulina when I opened the bag. I'm told I will get over that and even come to enjoy the taste of spirulina in time. For now and for all of you other first time users - I would recommend adding the powder to something else with a strong flavor. Spirulina is extremely low in calories - 26 per tablespoon. It's also packs a whopping 5 grams of protein per serving. Wow! One small word of caution is needed. Spirulina may contain heavy metals absorbed from the water where it grew. This can be very taxing on your liver to the point of causing damage. As with anything I recommend, make sure you know and trust your source that you buy spirulina from. So help me out all of you experienced spirulina users!!! Other than adding it to smoothies...how do you take your spirulina? I'm all for it, provided as you say, that the source is unpolluted. I've heard many good things about Spirulina (be sure to include it in the kids' diet as well). I've never seen it locally in powder form, only caplets, but then again, I haven't really looked. I love your straws I will tell others about them!! Daedra will be thrilled that you shared her straws with others! What Does Whole Grain Mean? What's In Your Medicine Cabinet? ?